Mariposa Grove may be approached either from Yosemite Valley or from the Fresno road. In any event, if you are pulling a trailer, it will be to your advantage to leave it at the South Entrance Ranger Station unless you plan to camp overnight at Big Trees Campground. One and nine-tenths miles beyond, at the bottom of a long grade, giant sequoias come into view. Recognized by their great height and girth and golden-brown bark, they stand like sentinels on either side of the road, guarding the entrance to this famous grove. These trees are difficult to photograph as little sun-light filters through to the great boles of their trunks. The Fallen Monarch and Troop F, Sixth Cavalry. Photo by Joseph Le Conte. Theodore Roosevelt and party, 1903. John Muir is to right of Mr. Roosevelt. the left marks the entrance to the Big Trees Public Campground, the only place in the grove where camping is permitted overnight. It was in this grove that President Theodore Roosevelt, in 1903, instead of staying in a hotel, deserted his erstwhile political friends, preferring to spend the night about a glowing campfire at the feet of these forest giants. Such experiences as his in this outdoor cathedral have been the inspiration for much prose and poetry since the discovery almost a hundred years ago. The Fallen Monarch. Diameter 10 feet above the base: 15.4 feet. * [ * All measurements marked thus are taken from Mariposa Grove Big Tree Survey. Prepared by E. C. Smith, Chief Engineering Aide, National Park Service, January 1942. (Measurements were made during summer of 1941.)] Within sight on the left side of the road is the Fallen Monarch. The date when this tree fell is a matter for speculation as even Indian legend fails to reveal a time when it was standing. Although the centuries have rotted the bark and sapwood away, the stone-like durability of the heartwood is a permanent monument to the majestic tree which once grew here. It was the custom in earlier days for the stagecoach filled with visitors to drive out upon the trunk to be photographed. Although the massive trunk shows great charred scars which it must have suffered in its last years, preliminary borings show a lack of any prior fire scars which might be used in dating its fall (see page 71). The Corridor Tree. Height: 249 feet; diameter 14.8 feet at 10 feet above mean base. A favorite stopping place of travelers of earlier days, the Corridor Tree, a hundred yards up the old stagecoach road, across the road from the Fallen Monarch, gives mute evidence of the ravages by fire. The freakish burning of ancient fires ate deeply into the heartwood, leaving a shell of little more than sapwood separated into six columns. Here one may enter into the tree, walking with ease around the central column of solid heartwood while looking out between the pillars of bark and sapwood as though they were doors and windows. The ceiling of this unusual chamber ends with the fire scars 30 feet above the ground. A wonderful example of the tree’s great healing powers is the new bark and new layers of wood added to repair the extensive damage. The Three Graces and Bachelor Tree. Height : 254 feet, diameter 18.9 feet; height 258 feet, diameter 13 feet; height 219 feet, diameter 16 feet; height 241 feet, diameter 21.9 feet. Diameters were measured at ground level. Typical of the grace and beauty of line that has inspired artists and poets alike is this group of younger giant sequoias . Easily seen from the roadway, their beauty is richly enhanced in the morning sunlight. The Grizzly Giant. Height 209 feet, circumference 96.5 feet, basal diameter 34.7 feet; diameter of first large limb 6 feet, 95 feet above the ground. Estimated age: 3.800 years. Signs and ample parking space mark the location of the largest and most conspicuous tree of the Mariposa Grove. Towering high above the surrounding great sugar and yellow pines and incense-cedars, the massive bole of the Grizzly Giant seems to fill entirely the clearing in the center of which it stands. No tree in this grove, or in any other grove of giant sequoias appears so rugged, so ripe with age. It is fittingly thought of as the patriarch of the grove. A comprehension of the size of the Grizzly Giant is difficult, standing as it does among other great trees of the forest. It is best expressed, perhaps, by the total volume of its trunk and the thickness of its many large limbs. The greatest thickness of the trunk at the base is 34.7 feet while the mean perimeter is 96.5 feet. The tapering of the massive trunk is so slight that ninety feet above the base it still has a perimeter of over 46 feet. Its tremendous size can better be appreciated when one realizes that the first large limb 95 feet above the ground on the south side of the trunk is six feet through, being itself greater in diameter than most mature forest trees. Growing about 100 feet above the ground on this large limb is a Sierra currant (Ribes nevadense). It was first noted about 1930. The Grizzly Giant, eliminating saw cuts and bark, would make 363,528 board feet of lumber if the brittle wood could successfully be logged. Many visitors find it interesting to speculate on how many houses could be built from such a quantity of lumber. Meanwhile, the tree is “used” for enjoyment and inspiration by thousands of visitors each year, but it is not “used up” as would be the case if it were converted to lumber. 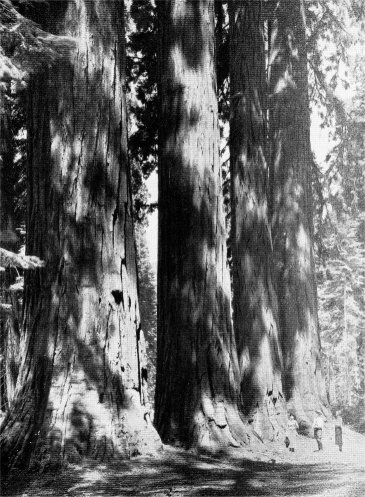 The Grizzly Giant is thought by many to be the oldest of the five largest known living giant sequoias although it has less volume than the others: the General Sherman, General Grant and Hart trees of Sequoia-Kings Canyon National Parks and the Boole Tree of Converse Basin near that park. No accurate method has yet been found of measuring the age of large trees. By the use of such an instrument as the ordinary increment borer the annual growth rings of only the outer two feet may be counted. Ever since the noted scientist, David Starr Jordan, estimated the age of the Grizzly Giant at 8,000 to 10,000 years, men have speculated as to its age. The conservative estimate of 3,800 years is based on a comparison of its size with that of other fallen trees whose annual growth rings have been counted, an attempt to tell whether it grew fast or slow in its earlier years by a study of the locality in which it is growing, and by its present appearance of antiquity. Fire has consumed over eighty per cent of the bark and sapwood at the base of the Grizzly Giant, and has eaten many feet into the heartwood, almost severing the living tissue connecting the trunk with the roots. Being able to procure only one-fifth of its normal supply of nutrients, it is able to grow and heal its old scars only very slowly. 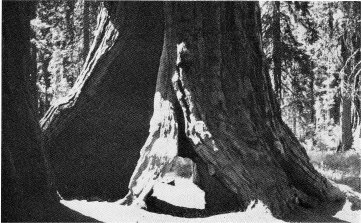 Following reports of the highest plant authorities that the excessive trampling of the soil above the shallow root structure of the tree was leading to its destruction, and that roads should not be located near the roots, a number of projects were undertaken for the protection of the Grizzly Giant. These included fencing and landscaping. Finally the roadway that once approached close to the Grizzly Giant was re-established some distance to the south and east of the tree, its present location. The new road, which affords passing motorists views from the most advantageous points, was built entirely with hand tools since the use of explosives might further injure some of the widespread roots which extend in some cases 300 feet from the trunk. 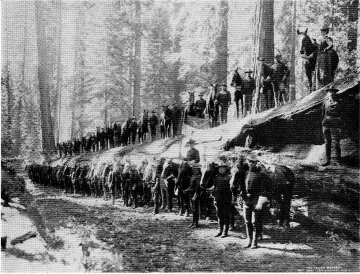 There has been much concern regarding the stability of the Grizzly Giant ever since the State Highway Commissioner made a statement to the press in 1904 that the Grizzly Giant leaned 18 feet from its center axis and was doomed unless immediate steps were taken to prevent its fall. 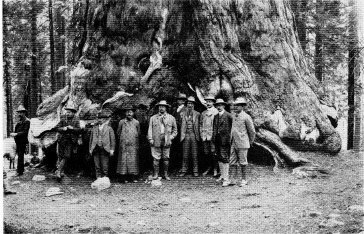 In answer to suggestions that cables be installed to help support the Grizzly Giant, Superintendent W. B. Lewis stated that the tree had an approximate weight of 3700 tons and that there was little man could do in propping such a weight. According to the most recent report of the park engineer, the tree has a natural lean in the form of a uniform curve extending from the base to the top, where it leans south 17.5 feet and west 5.5 feet. This lean, together with the largest of the limbs which are on the south side, causes the only hazard to the tree’s long continued life. The center of gravity, determined by volume, neglecting limbs and foliage, is at an elevation of 59 feet, where the lean is 4 feet, throwing it without the middle third line of stability as determined from the average base measurement . Overturning is prevented by two small, irregular sections of the trunk extending in such a manner as to retain the center of gravity within the stability limit counterbalanced by limbs and foliage on the opposite side and by the extensive root spread in all directions. Damage by fires which occur more than once each century and lightning strikes perhaps account for the dead branches in the top and the great fire scars in its trunk. In one storm in 1942 lightning was observed to strike the Grizzly Giant six times, wreaking great havoc and leaving on the ground mounds of cones and branches several feet deep. Still the branches of the Grizzly Giant bear each year many thousands of cones in which are a million tiny seeds. Having weathered a thousand storms through the centuries, the Grizzly Giant shows no evidence of giving up the struggle for existence. may be followed northeastward for about a hundred yards to the California Tree. It is one of the two living giant sequoias in the Mariposa Grove which has been tunneled . The cut was made in 1895. 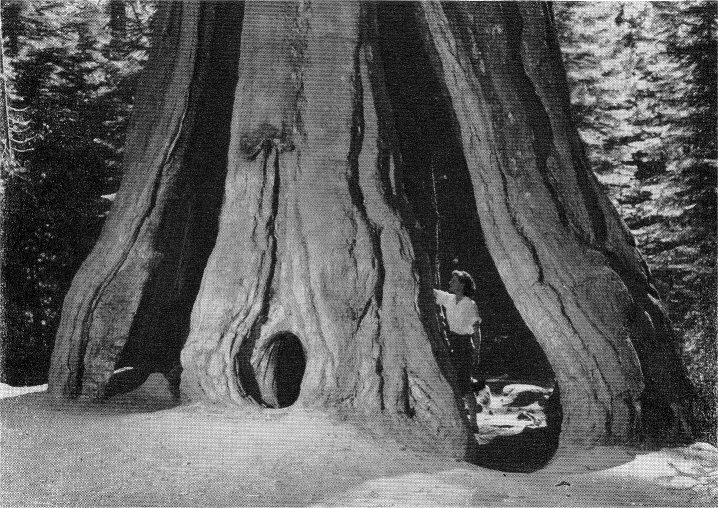 For many years it served as a substitute for the larger Wawona (“tunnel”) Tree which became inaccessible when the winter snows blocked the road through the upper part of the grove. 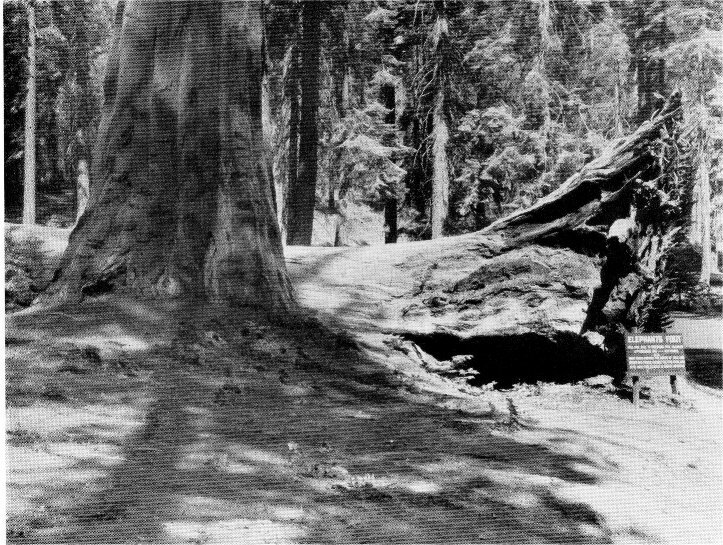 With the relocation of the road adjacent to the Grizzly Giant in 1932, the loop road to and through the California Tree was abandoned and landscaped as a footpath. sequoias. It is difficult for the casual visitor to recognize in these small saplings with the dark bluish-green foliage, purplish bark, and perfect pyramidal form the precursors of the forest giants which shade them. A closer examination reveals that even their juvenile foliage differs in the shape and arrangement of the leaves from their parents. The Faithful Couple (0.7 mile from the Grizzly Giant). *East: Height 248 feet, diameter 19 feet at 10 feet above mean base. *West: Height 248 feet, diameter 19 feet at 10 feet above mean base. A thousand years ago they were two separate young trees struggling with each other for soil nutrients and sunlight. Now, their living tissues are so intermingled that water absorbed by the roots of one may be used in making food by the other. Their great fire scars make it seem still more remarkable that they have both attained exactly the same height and girth. The Mather Tree (0.1 mile from the Faithful Couple). *52 feet high. Beyond the Faithful Couple, a short distance on the left, is the Mather Tree. 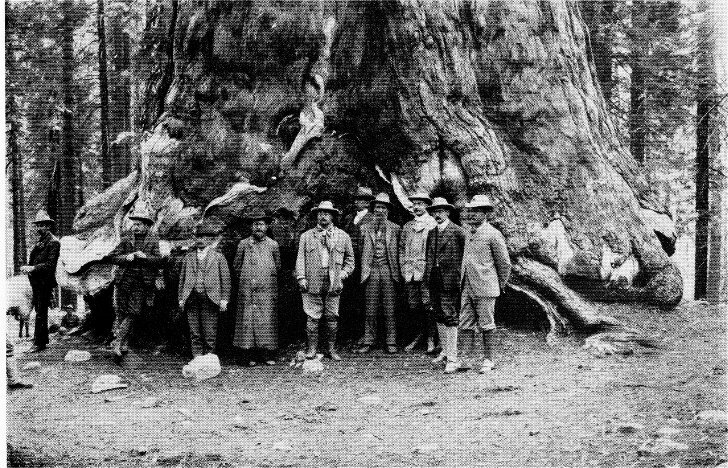 This 50 (estimated) year old giant sequoia was officially dedicated to Stephen T. Mather, a Californian, who became the first Director of the National Park Service when it was established by an Act of Congress on August 25, 1916. He held the same position until January 12, 1929, under three administrations, two of them Republican and one Democratic, serving under five different Secretaries of the Department of the Interior. He justly deserves honor from all American people for carrying the National Park Service through its most critical period and for personally financing the donation of many areas to the National Park Service. The Clothespin Tree (0.2 mile from the Mather Tree). Height: 266 feet, diameter 15.5 feet at 10 feet above the mean base. Extensive fire burns have left the trunk of this tree in the shape of an old-fashioned clothespin. By a 50-yard walk to the base of this tree the size of the opening, 70 feet high and 16 feet across, can be more easily realized. Although decidedly leaning, it may see the coming and going of many more generations before succumbing to the force of gravity. The Mariposa Tree (0.4 mile from the Clothespin Tree). * Height: 247 feet, diameter 17.4 feet at 10 feet above mean base. This tree and the grove have been given the name of the famous gold rush county. The county of Mariposa was named after a stream called “Las Mariposas” (Spanish for “butterflies") because they are seen in great numbers in this area at certain times of the year. Note that the fire scars of this tree are in the last stages of healing over. Big Trees Lodge (0.2 mile from the Mariposa Tree). Completed in June, 1933, Big Trees Lodge, in the heart of the grove, offers restful accommodations and distinctive meals served on an outdoor terrace. Needless to say it is necessary to .. make reservations well in advance during the summer months. The management will appreciate the courtesy of making meal arrangements for parties of any size at least a few hours in advance. This will make it possible to more satisfactorily serve you, especially during the rush season. bark). This large fallen tree is ir front of the Big Trees Lodge. The annual growth rings show an age of 820 years at the road cut 60 feel above its base. Allowing 50 year; to grow 60 feet gives it an estimated age of 870 years. The year it fell, 1817, has been accurately determined by matching its fire scar pattern (the intervals of growth between the fire scars) with that of living nearby trees It shows damages from fires which occurred in 1775, 1742, 1690 and 1652. The Sunset Tree. Height: 20: feet, and 17 feet diameter at 10 feel above mean base. A little to the left, behind Big Trees Lodge stands the Sunset Tree. Here, truly, is a tree living on “borrowed time.” Its base is chiefly a charred, ugly fire scar 51 feet across. It was very likely the great fire of 1710 which all but caused the death of this tree. It is characteristic that a tree sheds the foliage of the crown in proportion to the extent of the damage to its trunk. Having suffered more from fire and storm than any other tree in Mariposa Grove, this fire all but severed the living connection to the roots. The most westerly situation of all the ancient monarchs in the Mariposa Grove, it stands like a huge candle through the day, to be relit by the crimson glow of the setting sun. It is known as the Sunset Tree because the last rays of the setting sun reflect through its branches as twilight merges into darkness. The American Legion Tree Height: 250 feet, 18.3 feet in diameter 10 feet above mean base. Be yond the Big Trees Lodge, on the left, a plaque marks the location of the American Legion Tree, dedicated to the unknown dead of the First World War in 1921. Extensively damaged by fire and storn it still shows strength in its struggle to survive. The Haverford Tree. * Height 269 feet, 16.6 feet in diameter 10 feet above mean base. On the right as you enter the one-way loop road is the Haverford Tree. It has periphery of 106 feet around its great spreading trunk. Remarkable for its three great opening: which expose a cavity measuring 28 feet by 35 feet, it is said that as many as 15 horses have fount shelter there during stormy weather in stagecoach days. Then it was known as the “Shelter Tree.” Carved during past centuries by repeated forest fires, its huge fire scars are more photographed than any other in the grove. The tremendous weight of its stately bole is supported by three individual remnants of its trunk which hold the tree balanced in weird conspicuousness. During the period from May 27 to June 1, 1940, reports were heard for some distance as the fibers gave way and great cracks appeared in its cavernous bulk. Believing that another monarch was soon to fall, rangers controlled the traffic on the nearby road to prevent possible injury to visitors. One crack had widened to 1 1/2 inches by June 3rd. However, by some inner strength, its tissues and fibers have held. old, about 450 years after the birth of Christ. Although injured by many fires, the great fire of 1710 did the greatest damage. After parking your car in the Mariposa Grove Museum area, you will want to walk over to this tree and see these things for yourself. The Lafayette Tree. Height: 271 feet, 17.5 feet in diameter at 10 feet above mean base. To the left of the Haverford Tree is the Lafayette Tree with its large basal swell. Chipmunks, robins and juncos are often seen taking bark baths in the depressions in the bark just above the basal swell about seven feet high. In these depressions is a quantity of bark, finely powdered. Could it be that these animals have discovered insecticidal qualities of giant sequoia bark due to its high tannin content? 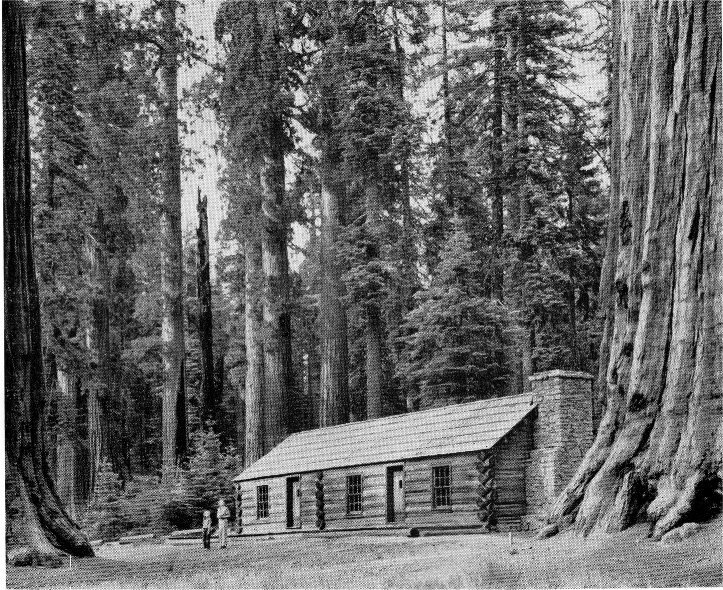 The Mariposa Grove Museum marks the site of the original cabin built by Galen Clark soon after he discovered the grove in 1857. The original cabin was destroyed about 30 years later and in 1885 the State Board of Commissioners built a second one on the same site. It housed the curio shop which was enlarged in 1902. 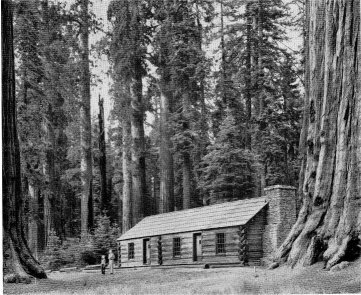 In 1930 the present cabin, a replica of the former structure, was constructed by the National Park Service to house the museum exhibits. These exhibits are devoted exclusively to the story of the giant sequoias, therefore the cabin and its furnishings were designed to harmonize with the natural surroundings . The massive furniture was hewn by hand from a giant sequoia that fell in 1919. Even the exhibit panels are made of giant sequoia wood. Here brief lectures are given throughout the day during the summer months by ranger naturalists of the Yosemite National Park staff. Fossil “sequoia” specimens are on display. A large relief map vividly portrays the near extermination of vast giant sequoia forests by rivers of ice descending the west slope of the Sierra Nevada during the last glacial period. The present limited distribution of the coast redwood and the giant sequoia are similarly shown. Specimens of wood, bark, foliage and cones of each species aid in further distinguishing the two species. Two exhibit panels portray the human history of the grove from its discovery by Galen Clark until the present time, a period of 92 years. 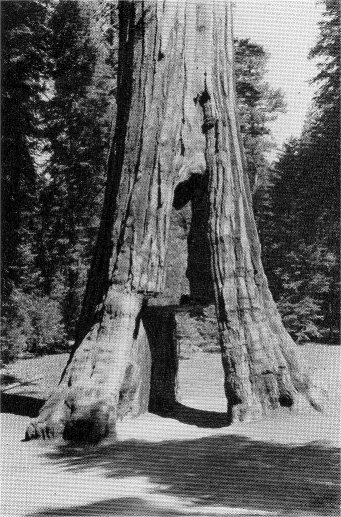 Of special interest is the wedge-shaped section, more than 18 centuries old, showing the life of a relatively young giant sequoia (see page 63 for photograph). This exhibit includes a panel showing six important historical events that occurred during the life. of the tree, and a panel of photographs showing the appearance of the tree at each one of the six growth stages. It is interesting to note that the earliest event portrayed is the imprisonment of St.
Paul in 58 A.D., thus identifying the life of the tree with the duration of the Christian Era. Colored photographs and dimensions of the four largest giant sequoias are displayed—the General Sherman, the General Grant, the Boole and the Grizzly Giant. The first three are located in or near Sequoia-Kings Canyon National Parks, which contain 60 per cent of all the living giant sequoias in the world. Current, temporary displays of some of the plants and animals with which the giant sequoias are associated are attractively arranged for your enjoyment throughout the museum. For your convenience the ranger naturalist on duty has for sale selections of books and pamphlets to meet your immediate interests in the giant sequoias and the wildlife of the region. Walked the shores of Galilee. Limitations of three score years and ten. Achieve a finer integrity of soul. Between the General Sheridan and the General Grant in the foreground can be seen the large Fallen Giant through which the roadway has been cut. The outer sapwood is decayed but the heartwood is well preserved although the tree fell in 1873. The cut through which the road passes is as black as though someone had painted it with creosote. This is actually a natural preservative, chiefly tannin, which is present in both the living and the fallen trees. The Fallen Giant also shows the shallow root system. Note there is no tap root. Before the cut was made in 1934 the roadway came in front of the museum porch and past the foot of the Fallen Giant. From Shirley, Redwoods of Coast and Sierra, courtesy University of California Press. the road are three giant sequoias. The farthest and largest one with the inverted V-shaped fire scar is the tallest tree in the grove, the Columbia Tree. It is pictured on page 89.